This Internet GIS application includes a simple and intuitive mapping interface that allows users to access and download certain local government tax/real estate information and maps. This application is designed to work on computers and tablet devices using the most current version (or one version previous) of most industry-standard Internet browsers. This help file is accessible via the help link in the application header, and is designed to aid the user in the operation of the application. Map Window: The interactive map display allows the user to explore maps and data of interest. 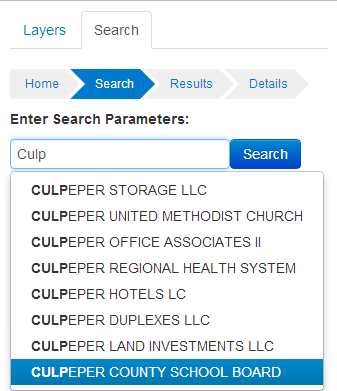 Layers/Search Tabs: Allows the user to turn off and on layers in the map and access results from searches and queries. Toolbar: Provides access to the analytical functions and more advanced tool in the application. Navigation Tools: Tools for moving around the map and clearing temporary features and sections. Basemap Switcher: Allows the user to select a basemap layer (or no basemap). Location Map: An overview map depicting the current map view within a wider perspective. Coordinates: Displays the real-time coordinate information of the cursor location. Bar Scale: Dynamically displays the scale on the map. Revision Date(s): Reports the last date of map and database revisions. Pan (Recenter map): Click on the left mouse button and drag the map to the new location. 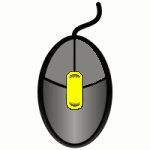 Zoom In/Out: Scroll the mouse wheel forward to zoom in and backward to zoom out. Each wheel click will zoom the map by about 50 percent in width and height. Zoom In (Window): Hold the Shift key down, then hold the left mouse button down and drag on the map to draw a rectangle. The map will zoom in to the area of the rectangle. Zoom In (Incrimental): Left double-click on the mouse to zoom in or out by about 50 percent in width and height. Zoom In/Out: Drag zoom slider up/down or left click +/- symbols. Pan: (recenter) Click the map with the left mouse button and drag to move the map display in any direction. Zoom Window In/Out: Select the appropriate magnifying glass icon, hold the left mouse button down and drag on the map to draw a rectangle. The map will zoom in/out to the area of the rectangle. Zoom Full Extents: Select globe icon and map will zoom out to the full map extents. Clear Map: Select the eraser icon to clear any temporary map features, drawings, selections, or map tips. Hover or pause the mouse over a parcel or point of interest to view its details in a small popup window (no click required). On touch screen devices, press and hold over a point of interest. The Basemap Switcher tool is used to select an available background basemap. You may select the Imagery button to load the aerial photography basemap, or the Streets button to load the ESRI Streets basemap. Note: If you select the loaded basemap's button again, the background basemap will turn off. If the basemap is not available at the current viewing scale, an alert box will notify you. The Location Map is located at the bottom right of the map and may be hidden by clicking on the arrows (minimize) button. This map depicts the current map view within a wider perspective. Once the Location Map is hidden or minimized, the arrows button will change to the maximize function. Select the arrow button again to maximize or show the location map. The Main Toolbar is located just below the application header/title banner. To launch a tool, select an icon from the toolbar. The Identify tool, Draw tool and Coordinates tool may display and/or prompt the user for additional information in the left pane (Search Tab). The Identify Tool is used to retrieve parcel information from a selected parcel. After selecting the Identify tool, click on a parcel of interest and the parcel detail report will appear in the left pane (Search Tab). This tool remains active until another tool or function is selected, so the user may identify many parcels in succession. To select multiple parcels by geographic criteria (such as polygon, line, circle and rectangle) please select the By Shape button on the Search Tab. To clear the highlighted/selected parcel, select the Eraser Icon located on the Navigation tool. Once a parcel has been identified on the map, a parcel detail report is displayed in the left pane (Search Tab). The user must use the scroll bar to see the entire report, or may download the information. The parcel detail information can be downloaded as a property card in Adobe .pdf format. 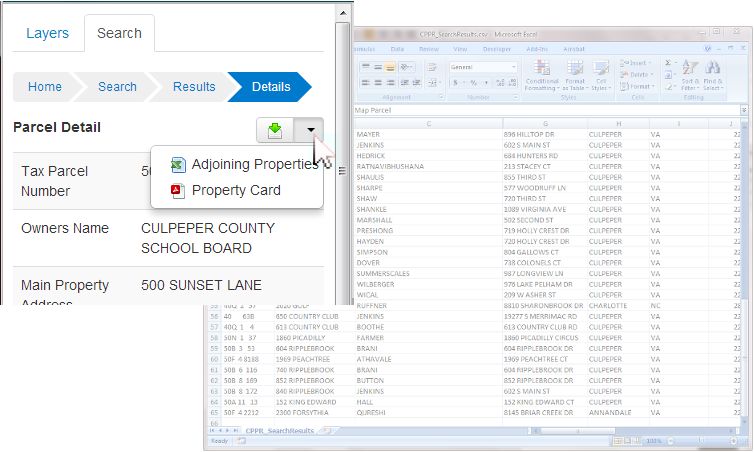 Additionally, adjacent real estate and tax parcel records are available for download in Microsoft Excel format. The Draw/Measure Tool is used to draw features and text on the map; and if desired, label the feature with area and distance measurements. After selecting the Draw/Measure tool from the Toolbar, a Draw and Measure Tab will appear in the left pane prompting the user for input. Select a feature type to draw and specify draw options (such as fill color, outline color and outline width). To include measurements, select the Show Measurements checkbox (on by default). The user may change the output units using the Areal and Distance Units drop down boxes. To begin drawing, move your cursor to the appropriate location on the map and click. Pop-up prompts displayed at the mouse cursor will lead you through the drawing process. For polygon and line features, each click on the map will place a new vertex, double click to finish the drawing feature. The measurement totals will appear in a flyout window near the object. 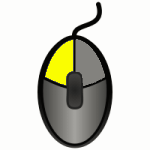 The measurement text may be highlighted with the mouse and copied (Crtl+C) for use in another application. To erase the drawing features, select the Clear Button located near the bottom of the Drawing Tab. You may continue to click the Clear Button to clear to remove all drawing objects. To quickly clear all objects drawn on the map, select the Eraser Icon located on the Navigation tool. Users can navigate around the map while they are using the Draw and Measure tool. The Coordinates Tool expands to include two functions, Zoom to Coordinates and Identify Coordinates. Use Zoom to Coordinates (zoom to point) if you wish to zoom or jump to a specific location (X,Y). When this is selected, a new Zoom to Point Tab will appear in the left pane prompting the user to input coordinate values. Enter coordinates and select OK. The map will then zoom or jump to the specified location. Use Identify Coordinates to report the values (Lat/Long) at the clicked location. Once this tool is selected, the user may click anywhere on the map and a flyout will appear with the coordinate values for that point location. To copy these values to the clipboard for pasting in other applications, select the coordinate value text using your cursor and hit Crtl+C. The Print Tool generates a printable Adobe .pdf file of the current map. When the Print Tool is selected, a new Print Tab appears in the left pane prompting the user for input. Enter the map title and author and select OK. A message will appear in the upper right hand corner of the map displaying the process status. Once the processing of the .pdf file is complete you may open the printable map by selecting the link provided. The printable map is north oriented (north is up) and includes the user-defined information, a bar scale, creation date and local government logo and disclaimer. The Copy/Save Map Tool, when selected, generates image of the current map view in a separate browser window. The user may copy this map to the clipboard (right click, copy ) to paste in other applications, or save the image (right click, save image as...). You may also resize or collapse the left pane (Search/Legend Tabs) using the grip slider on its right border. The Search Tab appears in the left pane of the application by default. Other tabs, such as Draw and Coordinates may also appear in the left pane when the respective tool is launched. Use the search tool to find parcel(s) by Owner's Name, Parcel Number, Physical Address, or Shape. Notice the search navigation bar at the top of the tab which highlights the current step in the search process. After a search is completed, you may click on this bar to move back and forth between search criteria, results and details. The process for using the search By Owner's Name, By Parcel Number and By Address all function in a similar fashion. The search By Shape function is documented in this section. Once a type of search is selected, a new search entry page appears (in Search Tab) prompting the user to input a search string. The example shown here is a Search By Owner's Name. Begin entering your search text into the input box provided. Upon entering the first three or four characters of your search text, a list of possible results will appear in a drop down list. You may select the appropriate name from the list or keep typing. When you are finished entering the search text, select the Search button to initiate the search. The search will return the results on a new results page in the Search Tab. To view the parcel detail report for a specific parcel, click on the arrow icon to the right of the record. The results of the search may also be downloaded to as an Excel spreadsheet (.csv format). To export specific records, select/check the checkbox next to the record. To select all records or clear the selected records, use the links at the bottom of the list. When you are finished selecting the records to be included in your download file, click on the Excel icon at the top right of the results list. 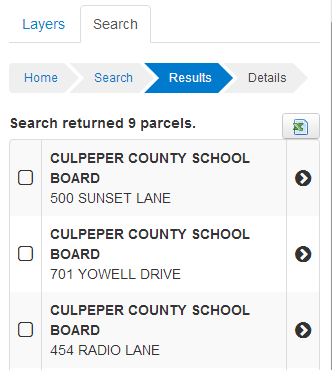 Click on the arrow icon to the right of the record to view detailed information about that parcel. You may go back to view your search results list or refine your search criteria by selecting the appropriate link in the search navigation bar. Just like the results of the Identify Tool, A Property Card or report may be saved to your computer as an Adobe .pdf file. An Adjacent Properties spreadsheet may be saved to your computer for use in MS Excel. The search By Shape function is used to find parcels that are inside or intersect features that you draw. You may draw multiple shapes prior to initiating your search. Begin by selecting the shape you wish to draw. To add the shape, move your cursor to the appropriate location on the map and click. Pop-up prompts displayed at the mouse cursor will lead you through the drawing process. To erase the feature drawn on the map, select the Clear button located near the bottom of the Search Tab. To erase all objects in the map, select the Eraser Icon located on the Navigation tool. Once you are finished adding the shapes for your search, select the search button. The search results will appear in the Search Tab and are similar to the results found pending ay search yielding multiple records. Just like the results of the Identify Tool and other searched, a Property Card or report may be saved to your computer as an Adobe .pdf file. The Layers Tab appears in the left pane with the Search Tab. Use the Layers tab to control the visibility (turn layers on/off) and transparency of layers. By default the Layers Tab is not active, and to view it you must select the Layers Tab. To turn on or off a specific layer, use the checkbox located to the left of the layer name. To adjust the transparency of a specific layer, select the icon. The layer list also acts as a map key or legend. To expand or view the legend for a specific layer, select the beside the layer name. To collapse or hide the legend, select the icon. Some layers are created with preset zoom levels that prevent the layer from being viewed at scales that are not optimal. This is indicated in the Layer Tab as layer names will be "grayed out" and italicized when unavailable to view. When the map reaches a zoom level that is optimal the layer name returns to normal text and its related controls become available. Above the application Toolbar, there are several links to related websites, including this help file. Directions - Links to Google Maps Directions with the Town of Culpeper as the predefined destination. 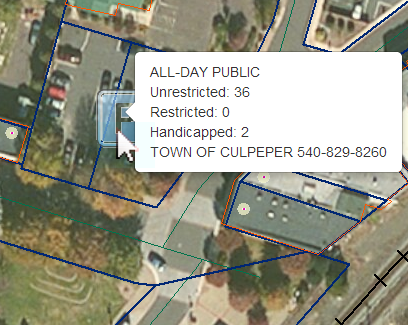 Contact Us- Links to an email form to contact the Town of Culpeper GIS Department.